The sensory table was always full (meaning full of stuff and full of kids!). We put tons of stuff in it- noodles, flour (messy, but fun), rice, sand, water, corn, beans, feathers, pom-poms, flower petals, etc. (Depending on where you teach or what types of students you have in your class, some people/places don't put food in their sensory table, but we did at our school.) Then you can put any type of tools in to go along- measuring cups, funnels, rakes, shovels, tweezers, etc. 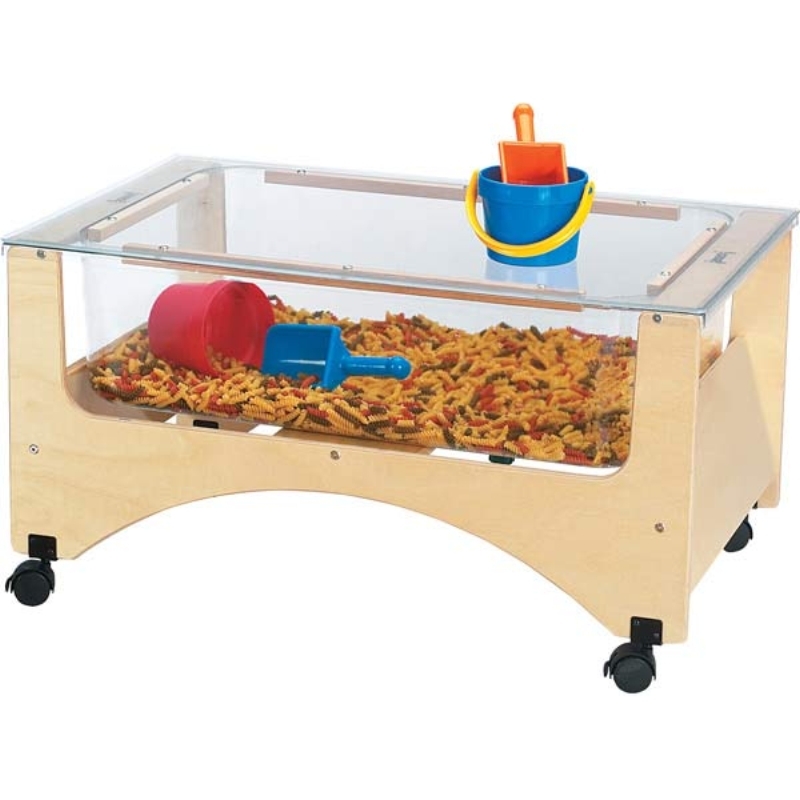 The possibilities of what you can put in your sensory tables/bins/tubs is basically endless. Since we don't have room in our house for an actual sensory table, I have made Norah some sensory bins. Today we broke the first one out! I have a bin for each item, because I was able to buy them for pretty cheap and am able to store them in our basement, but you could easily just have one bin and switch out what you want to put in it (but then you'd still have to store the items you aren't using somehow and clean the bin each time). There are so many reasons why sensory play is important. Spending time stimulating their senses helps children develop cognitively, linguistically, socially and emotionally, physically and creatively. I saw the benefits in my classroom everyday. It is calming for students who need a cool down, it's a good outlet for keeping their hands busy, and it's so fun! Our sensory table was almost constantly in use. This post definitely brings my "teacher nerd" out, but I love it. I chose pom-poms and measuring cups for Norah's first time because it wasn't food (so I thought she would not be as likely to put it in her mouth), and it's super easy to clean. Norah is 10 months, and she loved it! And she only put one in her mouth, so I consider that a great success! Can't wait for Norah to use more sensory bins! Aunt Karlie was here to play too!